If I Do Not Want to Settle, Can I Collect Weekly Wage Benefits for the Rest of my Life? Unless your case is deemed “catastrophic,” you can only collect lost wage benefits for a total of 400 weeks (which amounts to around 7 1/2 years) from the date of your injury. However, the likelihood that you or any claimant will collect 400 weeks of wage benefits is very, very slim. First, realize that workers’ compensation insurance carriers will do everything they can to argue that your benefits should come to an end. They will regularly ask (or pressure) your doctor to issue a return to light or full duty work. They will put you under surveillance and if they catch you doing some activity that seems inconsistent with the medical problem that has you off work, they will ask the State Board to terminate your benefits. 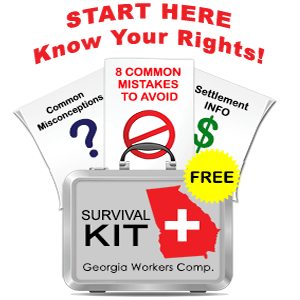 Second, if often makes sense to settle a workers’ compensation claim well before the expiration of 7 1/2 years. The maximum settlement value occurs when there are unknowns – how much longer will you be out of work? will additional medical procedures be necessary? how much financial exposure to the insurance company is at stake? A big part of my job as a claimant’s lawyer is to recognize when a settlement may be in my client’s best interest. What Does this Designation Mean? (6)(A) Any other injury of a nature and severity that prevents the employee from being able to perform his or her prior work and any work available in substantial numbers within the national economy for which such employee is otherwise qualified; provided, however, if the injury has not already been accepted as a catastrophic injury by the employer and the authorized treating physician has released the employee to return to work with restrictions, there shall be a rebuttable presumption, during a period not to exceed 130 weeks from the date of injury, that the injury is not a catastrophic injury. During such period, in determining whether an injury is catastrophic, the board shall give consideration to all relevant factors including, but not limited to, the number of hours for which an employee has been released. A decision granting or denying disability income benefits under Title II or supplemental security income benefits under Title XVI of the Social Security Act shall be admissible in evidence and the board shall give the evidence the consideration and deference due under the circumstances regarding the issue of whether the injury is a catastrophic injury; provided, however, that no presumption shall be created by any decision granting or denying disability income benefits under Title II or supplemental security income benefits under Title XVI of the Social Security Act. In theory, therefore, a claimant with a catastrophic injury could receive lifetime weekly wage benefits. However, as is the case with non-catastrophic injuries, very few claimants end up receiving lifetime benefits. Insurance companies use surveillance to gather evidence to be used against a claimant. Insurance companies will regularly review your medical records and if they see either medical improvement or an intervening medical problems not related to your work injury, they will argue that your catastrophic designation should be removed. A catastrophic designation can increase the settlement value of your case as the insurance company’s financial exposure is greater. Interestingly medical benefits under workers’ compensation are not subject to a 400 week cap. However, like any workers’ compensation benefit, the further away in time you are from the date of your accident, the likelihood will increase that the insurance carrier will try to find a reason to cut you off.